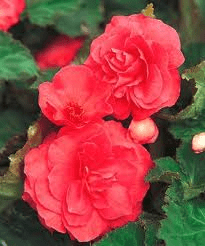 Tuberous begonias are bulbs that can grow well in the ground, in pots or, popularly, in hanging baskets. They provide large, bright blooms and a long flowering season, but if planted in the ground they must be dug up and overwintered indoors. They are different from their smaller cousin, flowering begonia, often seen as a houseplant. Tuberous begonias like plenty of sunlight but prefer it to be indirect or filtered. The extremes of deep shade or full sun will not allow them to grow. They can withstand direct weak sun, as in the early morning or late afternoon, but should be in dappled light during the most intensely lit parts of the day. The bulbs, or tubers, will not survive cold temperatures, so begonia tubers must be stored indoors for the winter. This process should take place after the first frost. In pots or containers, use potting mix with a small amount of sand mixed in for tuberous begonias. In the ground, they prefer garden soil with some amendments of compost or peat moss. Soil should be moist but well-drained. Mix in some sand, perlite or moss if the soil is heavy or clay. They are not drought-tolerant, so watch your rainfall, and water your begonias when the soil is just slightly dry. As with many bulbs, tuberous begonias should be planted after frost danger has passed. They may need staking once they are a 6 inches tall. Fertilize about once a month with a balanced mixture. Tuberous begonias sometimes suffer from a white powdery mildew infection; this is best prevented by allowing good air circulation around the plants and not over watering.